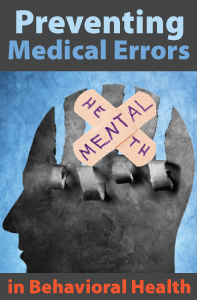 Preventing Medical Errors in Behavioral Health is a 2-hour online continuing education (CE/CEU) course that satisfies the medical errors requirement of Florida mental health professionals. When the Florida administrative code first mandated that licensees’ biennial continuing education requirement was to include two hours of training on the prevention of medical errors, there was a considerable amount of grumbling on the part of many licensees in the mental health field. The general sense of it was that – since we do not practice medicine – what is the relevance to our practice? The level of discontent was further amplified by the content requirement proposed by several of the Florida boards, which required specific topics to be included, topics that seemed to be more relevant to medical practice than psychotherapy practice. Professional Development Resources is approved by the American Psychological Association (APA) to sponsor continuing education for psychologists; the National Board of Certified Counselors (NBCC ACEP #5590); the Association of Social Work Boards (ASWB Provider #1046, ACE Program); the California Board of Behavioral Sciences (#PCE1625); the Florida Boards of Social Work, Mental Health Counseling and Marriage and Family Therapy (#BAP346), Psychology & School Psychology (#50-1635); the South Carolina Board of Professional Counselors & MFTs (#193); and the Texas Board of Examiners of Marriage & Family Therapists (#114) and State Board of Social Worker Examiners (#5678). This entry was posted in CE Courses, Counseling CE, Marriage & Family Therapy CE, Mental Health, Psychology CE, School Psychology CE and tagged CE, CEUs, continuing education, Counselors, Florida, Medical Errors, Mental Health, MFTs, Online Courses, Preventing Medical Errors, Preventing Medical Errors in Behavioral Health, Prevention of Medical Errors, Professional Development Resources, psychologists, Social Workers by Gina Gunderson. Bookmark the permalink.